Stunning, seaworthy, and swift, WILD KINGDOM offers guests so much to love. Thanks to an exceptionally pleasing layout, there are spaces just right for sharing special times with close friends or family, hosting a party, or unwinding in serene seclusion. 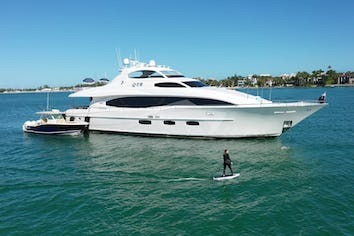 Fun-seekers will love the full array of watersports toys—more than you might expect on a yacht this size—plus a large, luxurious tender perfect for sightseeing and fishing. And with four spacious and elegant staterooms, WILD KINGDOM accommodates eight guests in enviable style. The main salon’s plush settees and soft cushions envelop guests in refined relaxation, while muted colors and fine woodwork enhance the atmosphere. Thanks to unusually wide, tinted windows, guests may enjoy broad views of the surrounding scenery while maintaining complete privacy. Sliding glass doors open from here to the aft deck, creating a delightful, al fresco extension to the salon. 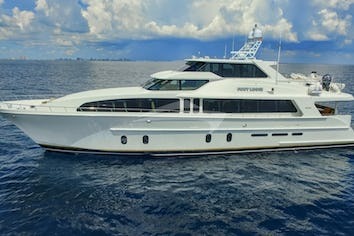 The aft deck’s banquette and table, plus bar with chairs and a TV, make this an especially popular gathering spot throughout the day, from breakfast in the fresh air to cocktails and casual dinners. On more formal evenings, the dining area at the forward end of the salon is the setting for opulent meals served by candlelight. Farther forward, yet another dining area adjacent to the galley is the spot for snacks, casual meals, and card games. It’s also a perfect place for kids to eat when parents prefer a quieter evening. Up on the sundeck, guests have a choice of stretching out on the sunbeds, soaking in the Jacuzzi, or enjoying the shade beneath the hardtop.This elevated perch is an especially popular spot for surveying the sights when the yacht is underway. As soon as the day’s destination is reached, the crew can quickly lower the water toys overboard, creating even more room to relax. Up on the bow, a circular banquette invites conversation and offers a great view of the crew deploying the anchor or bringing the yacht alongside a dock. A few steps down from the sundeck, the wheelhouse’s curved settee and table make a convenient place to read, look after a little business,or observe the skill with which the captain handles the boat. All four of WILD KINGDOM’s guest staterooms are appointed with personal entertainment system and ensuite bathrooms enhanced with fine marble. French doors lead through a private foyer into the full-beam master, with king bed, desk, settee,large closet, and ample drawers. The suite’s his-and-her facilities are connected by a central shower. A queen stateroom and a twin stateroom are also located on this level. The VIP stateroom, on the main deck, has a private entrance and is a particularly peaceful sanctuary. Staterooms are appointed with Molton Brown bath amenities and new linens and towels. 2018 extensive refit - upgraded all electrics, all new carpet, AV system upgrade. Growing up in a little town south of Boston called Duxbury, Rob was constantly around boating. As a child and all throughout high school, he was an oyster farmer out of Duxbury Bay. He has been working in the yachting industry for six years having been the first mate on private and charter yachts ranging from 93' to 130'. 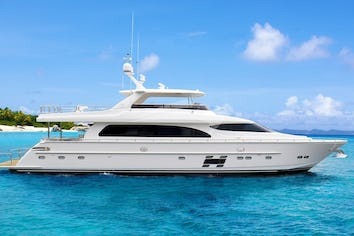 For the past few seasons he has worked in the Bahamas and Caribbean, mainly based out of St. Thomas and the BVls, where he was the first mate on charter yachts. His passion is taking guests fishing out on WILD KINGDOM’s tender, using his experience and skills acquired from working on sports fishing boats.